When Nasir Bin Zakaria arrived in Chicago in 2013, there were just around 300 Rohingya families in the city from his native Myanmar, also known as Burma. He said the word Rohingya drew blank stares from Americans he encountered. 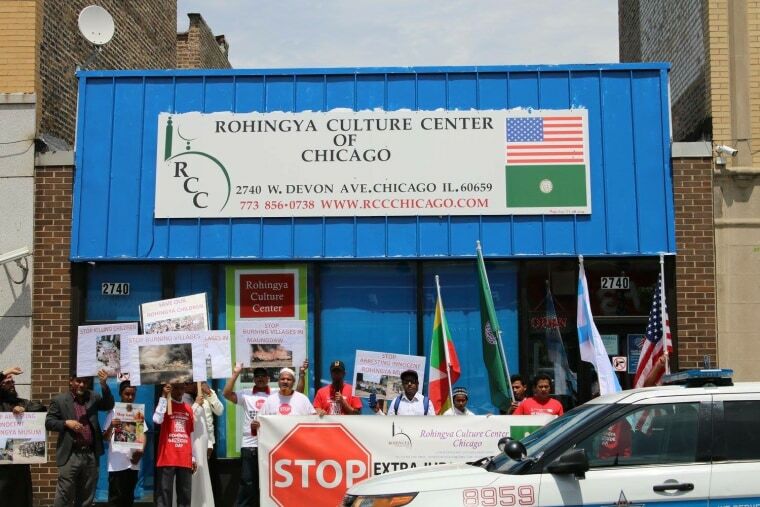 There are now approximately 1,500 Rohingya living in Chicago’s north side, according to the Rohingya Culture Center (RCC), an organization that helps the refugees settle into the city. Since 2011, the city has become a haven for the beleaguered Muslim minority, who were stripped of Burmese citizenship in 1982. According to Melineh Kano, the executive director of the Chicago-area resettlement agency RefugeeOne, the majority of Chicago’s Rohingya community are families with school-aged children, mainly resettled from third countries like Malaysia, where Rohingya wait in a refugee limbo without the legal right to work or attend school. Zakaria left Myanmar at the age of 14. “I was scared,” he said about the experience. “The military was looking for me.” Zakaria said he hid in the jungles before fleeing to Malaysia, where he was arrested twice before being deported to Thailand. By the time he landed in Chicago, he was grateful for the opportunity to start over, even as a dishwasher. Although Trump has capped the refugee admission cap for the 2018 fiscal year at 45,000 — the lowest since 1980, according to Reuters, Illinois is one of the ten-largest states for refugee resettlement, according to Pew Research. Since October 2016, the U.S. has admitted almost 5,000 refugees from Myanmar. Zakaria, who still has seven brothers in Myanmar, said it’s difficult for Rohingya to turn away from news about the humanitarian crisis in Rakhine state. “I’m always talking to them, asking what’s happening. There is no safety zone in Burma right now,” he said, adding that his WhatsApp messages are a stream of pleas for help. Zakaria, like many Rohingya in Chicago, has organized financial assistance by calling on a network of contacts inside Myanmar, asking for members of a village to coordinate emergency donations for those most at risk. Zakaria said there is an overwhelming need for food and medical supplies. “People are dying and going hungry because there is no food in the village,” he said. “The government is not helping.” Zakaria said he does what he can to help individuals who contact him, but admitted that it’s difficult to reach everyone. And Zakaria isn’t the only one receiving these messages — the entire Chicago Rohingya community is inundated with calls for help, he said. For Zakaria, that means getting on the phone and appealing for help from fellow Rohingya and Muslims across Myanmar and the U.S. to send money and let the wider world know what’s happening in Rakhine state. Still, it’s not easy to mobilize resources as refugees facing integration and economic challenges of their own. Last year, Zakaria led the opening of the Chicago-area RCC to ease the transition process for others new to America. The organization helps members of the local community overcome a variety of challenges, offering financial support for rent, job location assistance, and English tutoring, Zakaria said. The group also serves as a bridge to a new life in America, providing families with skills enrichment classes, youth mentoring, and financial literacy training. Thus far, donations have come on an individual basis from Chicago to Myanmar, village to village, in response to the growing humanitarian crisis. This is no small feat, given the community’s marginal socio-economic status. “Many start with entry-level, minimum wage jobs, so it’s not easy for them to pay the rent or have enough food for their own survival and help in a significant way back home — but they try,” said Kano, the resettlement agency executive director. For a decade, the Zakat Foundation of America — the Rohingya Culture Center’s financial sponsor — has been organizing emergency relief for the persecuted minority, according to Nour Zein, the group’s public relations coordinator. Alongside food packages containing necessities such as salt, rice, cooking oil, lentils, baby food, and water-purifying tablets, the foundation has also distributed blankets, cooking utensils, tarps, and mosquito nets for refugees living in make-shift tents, Zein said. Medical volunteers and supplies have also been dispatched to health clinics on the Myanmar-Bangladesh border, where injured Rohingya are often treated for bullet wounds, according to Reuters. The RCC is also expanding its lobbying efforts by sending letters to members of Congress advocating for political solutions to the crisis. Although the U.S. recently announced more than $30 million in emergency humanitarian aid for the Rohingya, some Rohingya say addressing the root causes of the crisis is of prime importance.